2. The Nine Planets from 398 A.D. to 428 A.D.
3. The Nine Planets from 2250 A.D. to 2280 A.D. The main purpose of this record is to present Kepler's Harmony of the World for a period of several centuries. We decided that the length of time represented would have to be at least as long as the period of revolution of the slowest planet, Pluto. Pluto's period is approximately 248 years or, in our terms, 20 minutes and 42 seconds, and we chose a total length of 22 minutes, representing 264 years. When one listens to the full nine-part Harmony - six tonal and three rhythmic "voices" - one may find it difficult to sort out the individual voices and assign them to the planets they represent. Therefore we begin by introducing the planets one by one, from the innermost to the outermost. The first you hear is Mercury, which as the innermost is the fastest and the highest pitched. It has a very eccentric orbit (as planets go), which it traverses in 88 days; its song is therefore a fast whistle, going from the E above the piano (e""') down more than an octave to about C# (c#"") and back in a little over a second. Venus and the Earth in contrast have nearly circular orbits. Venus' range is only about a quarter tone, near the E next above the treble staff (e"'); Earth's is about a half tone, from G (g") to G4# at the top of that staff. Together they drone a sixth, but the sixth is continuously changing from major to minor, or even down partway to a fifth, as the two planets go through their cycles - about 3 seconds for Venus, exactly 5 for Earth. Kepler compared Earth's sad minor second to the first minor second in the standard Do-Re-Mi scale - mi-fa-mi - and for him it sang of Earth's unending misery-famine-misery. Living into the period of the Thirty Years War, and indeed dying then, he knew what he was talking about, and for many millions in our own century, the song has not changed. Next out from the Earth is Mars, again with an eccentric orbit. Its song is distinctive, one of the easiest to pick out in the full Harmony. Alone in the alto, it ranges from the C (c") above middle C down to about F*~ (f4t') and back, in nearly 10 seconds. The distance from Mars to Jupiter is much greater than that between the inner planets (as mentioned above, the asteroids in this gap may represent a missing planet), and Jupiter's song is much deeper, in the baritone or bass, and much slower. It covers a minor third, from D to B (D to B) just below the bass staff. Still farther out and still lower is Saturn, only a little more than a deep growl, in which a good ear can sometimes hear the individual vibrations. Its range is a major third, from B to G (B2 to G2),the B at the top being just an octave below the B at the bottom of Jupiter's range. 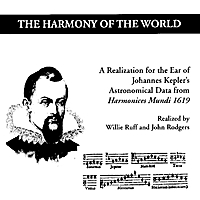 Thus the two planets together define a major triad, and it may well have been this concord - in the ratio 4:5:6, inevitable when angular velocities are equated with pitches - that made Kepler sure he had cracked the code and discovered the secret of the celestial harmony. Saturn's cycle is about 2 1/2 times that of Jupiter (almost 2 1/2 minutes vs. almost 1 minute), and their songs commonly strike the concordant ratios. This would be even more evident if the speed of the music were doubled, so that the cycles were half as long and the pitches were all raised an octave; together they then sing a majestic counterpoint in the key of G Major. The outer, post-Kepler planets we have simulated not by musical tones at the given vibration frequency but by sharp rhythmic beats. Uranus is a rapid ticky-ticky-ticky changing gradually from less than 9 to more than 10 per second and back but over a period of 7 minutes, so that the change is not easy to detect. When the much steadier (because much less eccentric) Neptune is added, however, at nearly 5 per second, the changes in Uranus' rhythm become more obvious, because the ratio between the two shifts continually back and forth from less than to more than 2:1, and the resulting "beats" are readily discerned. Finally Pluto's bass-drum beat is the foundation of the whole structure. Although its period is so long - 20 minutes and 42 seconds - its orbit is so eccentric that the gradual slowing down and even more the speeding up of the rhythm is manifest. At Pluto's slowest, the ratio with Neptune is almost 1 to 2 1/2, yet near its fastest their rhythms are identical and at the highest point Pluto is actually a little faster, because in fact at its closest point to the Sun it is actually closer than Neptune ever comes (lending credence to the view that Pluto is only an escaped satellite of Neptune's). Thus the relation between the two rhythms is continually changing, and "beats" come and go as they come into a simple ratio and then recede from it again. The additional doubled rhythm of Uranus, ticking away above, adds greatly to the fascination of this cross-rhythm. We have inserted a part of the Harmony at half speed. The inner planets come down an octave and are clearer and more readily grasped. Jupiter on the other hand retreats into the basement, and Saturn is hardly audible. The cross rhythm of the outer planets proceeds at half pace, and its intricacies become even more apparent. Part 2 begins with several minutes for the rhythmic planets alone, introduced one by one from Pluto in to Uranus. Then we add the visible planets, this time in order from Saturn to Mercuryrepresenting the second half of the full Harmony of the World, characterized particularly by the steady acceleration of Pluto to its perihelion and then a minute or so of relaxation beyond. Since proportion is the key to Kepler's idea of the Harmony of the world, this recording can be played at slower or faster speeds. Slower speeds will lower the pitches and allow for a greater harmonic appreciation of the inner planets while reducing the tonal presence of Jupiter and Saturn. Higher speeds will bring Saturn and Jupiter into Tonal prominence but Mercury will climb near or beyond the upper limits of our pitch perception. This realization of Kepler's data was developed at Yale by Professors Rodgers and Ruff and recorded at Stanford University by Mike McNabb, Sound Synthesis Consultant.